Hey, anybody that might be interested in hearing me blather on about Pinstriped Bloodbath can hear it over at the dollar bin website. It's nice and short, so it's not too painful. Thanks to Adam for the interview. 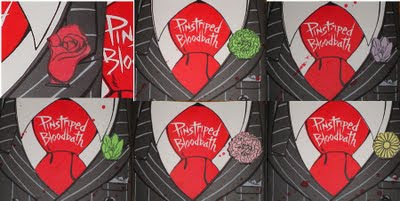 Also here's more pics of Pinstriped Bloodbath. The book is getting out to retailers now and for every shop I'm including a proprietary flower for the lapels. Each shop has it's very own flower. Above are the flowers for the awesome comic shops, Atomic Books, Zanadu Comics, Titan Comics, Space Cat, Jim Hanley's Universe, and Chapel Hill Comics.